There is a massive and common confusion in our modern day equestrian world about when and how our North American domestic breeds came into being. There are several factors operating in this muddle; one is our 'collective amnesia' about our original sport horse breed (Running Horse); plus other elements compound this problem, such as our unconscious assumption that a breed is 'pure-bred' and has a registry--neither of these is historically correct. Then on top of this mindset the effects of the 'warmblood invasion', where their 'breeds' and methods have been super-imposed on our pre-conceptions. The result is an utter disconnect with regard to our own equine history and traditions. Let's begin with a definition of sport horse: a population of horse selectively bred for performance in a particular sport or group of sports, normally with selection based on specific pre-potent bloodlines. Therefore there is often a performance standard, a type standard and a pedigree standard in most sport breeds. North America is blessed with many established breeds of light horse that are true sport horses. This story of how and when these marvelous breeds came into being has been absent from or slanted in our popular equine literature. Therefore most modern day equestrians are unaware that North America's first domestic breed of horse was a sport horse, and that it did not go extinct until the early 20th century, and it is the parent breed of all our best sporting horses of today. The American Running Horse was America's first domestic breed of horse. It was immensely talented and pre-potent, prized for its blinding speed at the gallop, it's comfortable mid-gaits (pace, rack, amble) and its agreeable temperament, its stamina, toughness and skills as a hunter horse. It was both a sport horse and a riding horse. The Running Horse survived as a breed for three hundred years and left a modern day legacy of eight separate quality light horse breeds that are directly descended from it. (North American Sport Horse Breeder). Let me quickly outline some points on the development of our first breed of horse that may not have been conveyed to you. In North America the early colonists were avid racehorse enthusiasts. And contrary to most modern day assumptions the breeders of first domestic breed of sport horse (racehorse and hunter) were extremely intelligent and educated persons (Governors and Plantation owners) who with the help of huge land grants provided for them, and armed with vast wealth of their own, they set about immediately to import the very best racing stock from the 'old country' with the aim of continuing the sports they loved in their new home. They imported from 1611 to 1660 the very best racehorses from Ireland and England, and it was their passion to breed from those select horses wonderful racehorses and hunters. These horses were not Thoroughbreds--that breed did not exist then, they were English Running Horses and Irish Hobbies. Happily, our forefathers were very successful in this endeavor, and we the North American sport horse breeders, four-hundred years later, are still reaping the harvest from their intelligent breeding procedures. This racehorse birthed in our Colonies, the American Running Horse, has been the subject of group memory loss in our equestrian community even though it was still around into the early 1900s. 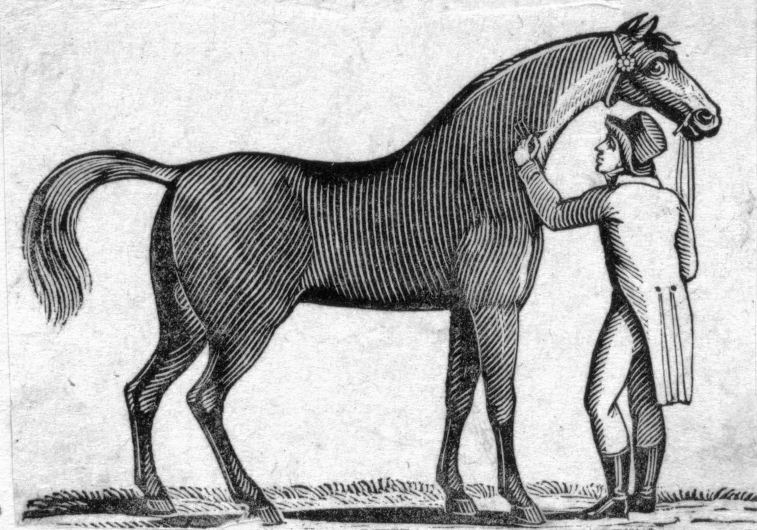 Yet, it was a world renowned horse in its heyday, both as a top quality racer at both the pace and the gallop, and later at the trot (1800s), but in addition it was the most prized saddle horse in the world, as it had retained its pace derived intermediate gaits, and therefore was more comfortable to ride than a horse that only trotted at the mid-gait (posting had not yet been invented). It also possessed a gentle and willing temperament, and was incredibly hardy, plus it was loaded with both stamina and speed. From this original American sport horse descend our best modern day light horse breeds. But because we have 'forgotten' about it and assumed all breeding done in colonial times was 'willy-nilly' by idiots, we are at a loss to explain the origin of the excellence found in our modern breeds and when it was they truly emerged. Failure to recognize the original breed, has made the starting date of our modern breeds waiver around, instead of clearly identifying our breed's birth by its true organization time, which would be when there was a conscious selection for type combined with specific performance and bloodline factors; instead most assume they just sort of emerged out of the colonial primordial soup. Registries are a nineteenth century invention--prior to this era breeds were organized by breeding practices and performance standards. By the 1950-60s most North Americans had adopted the belief that all breeds were 'pure-bred' as we had by then long established registries for all our domestic light horse breeds. So entrenched was this mindset that I remember being instructed that the Hunter Horse (our true American 'warmblood') was a type, not a breed. But it wasn't long after this that the European Warmblood invasion began in earnest, and this caused more disconnect with our heritage, as their 'breeds' are not pure-bred either, yet they promoted them as true breeds--national breeds--the pride of their countries. 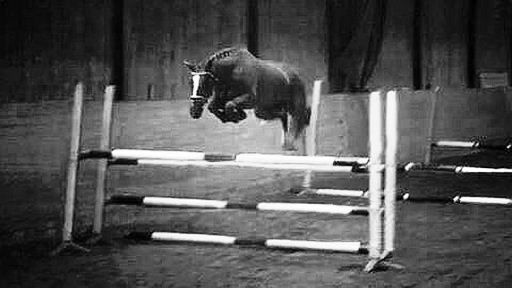 Somehow we did not make the intellectual leap that our Hunter Horse was every bit as much a breed as their 'warmbloods'. 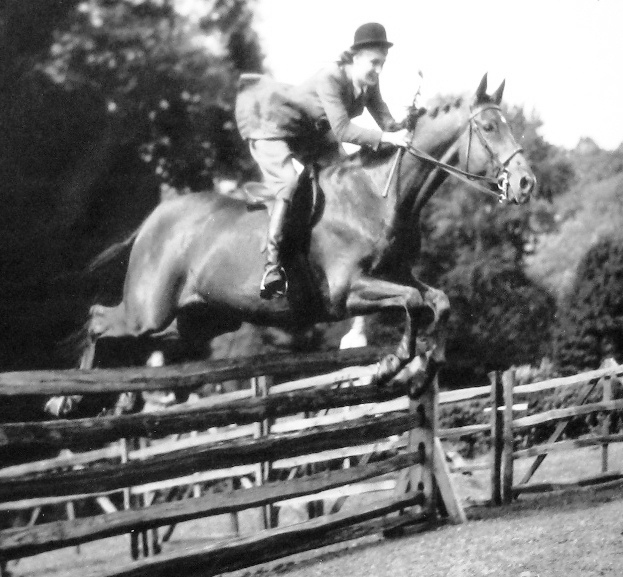 Even though I was part of this generation of equestrians in the later twentieth century, I still am not sure how it was we did not classify our own Hunters as true sport horses--even while they were competing against and often winning the medals in international sport competitions. Thinking back on all this, perhaps the answer lies in the fact we always had Hunter Horses and then we assumed that everyone did, and so when introduced with these 'new' breeds, which were presented to us with so much hoopla, then we assumed that they were a different new type--when in fact they were heavy hunters. The reality of course is that the horse that can jump, achieve under saddle perfection, run with talent and courage cross-country etc. has always been the same type, and the ingredients have always been the same: racehorse, pure-bred or mixed with other breeds, in other words: a Hunter. Therefore, for your reference, let me list a brief description and the emergence date of our sport breeds for you. These dates were arrived at by carefully studying the intent of the breeders of the day and the implementation of an organized set performance standard with consciousness of sport bloodlines. Running Horse (RH): This is our original saddle/hunt/racing breed. Even though we know that the first Governor of Virginia imported Hobbies for his own sporting pleasure in 1611, the evidence of an established breed came a little later. It is documented in the records of the original Kings Council of Jamestown (1624) that all the members of the Kings Council (Governor and eleven Plantation owners) were already racehorse owners and most were also breeders (Hervey). These breeders first tested their stock with sprint racing and within fifty years heat-racing as well. These horses were always expected to be Hunter Horses because Virginia and all the original colonies were overrun with the eastern wolf, and bounties were quickly established for its eradication. The sportsmen in the Rhode Island portion of the Massachusetts colony (once again the Governor and the Plantation owners) were not under the Puritan prohibition of racing, and so about sixty years later (~1690) they too were breeding and testing their own racing horses, which would soon become known as the Narragansett Pacer. The two populations of racers traveled by ship between the two centers of racing to both race and for sales and breeding purposes. American Sport Horse (ASH)--aka Hunter Horse: We know the colonists were hunting on horseback in the early 1600s, there were even laws in place by the mid-1600s concerning the amount of bounty to be given for both fox and wolf. Nonetheless, the documentation of selective breeding of mounts specifically for the sport of hunting is found first in the correspondence between the plantation owners of Maryland/Virginia by 1700. These horses were either full Running Horse or based on the RH with other breeds added for substance, height and style. 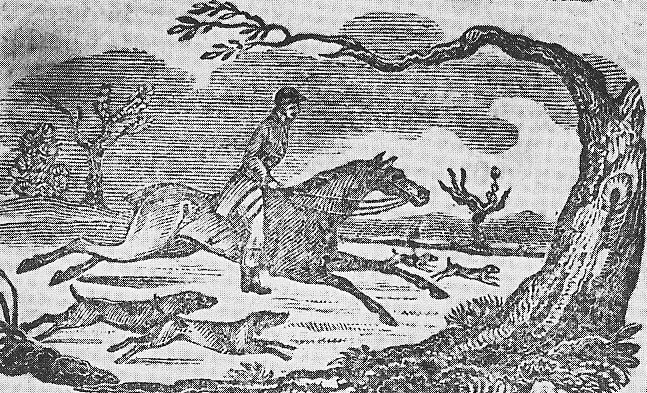 Once again, originally this sport, and the intelligent selection for this breed, was restricted to the most privileged settlers; but by the late 1700s Hunt Clubs were widespread and the hunt sport mania had infiltrated the general populace and all those that had access to a fine Hunter-bred horse joyfully participated. Hunt Clubs typically had a main building with bedrooms for out-of-town guests, meeting rooms and dance areas. The grounds were set up with kennels for the hounds, and with areas for testing the horses which included riding and jumping rings, a racetrack and a cross-country area with a steeplechase section (Fox Hunting in Delaware County Darlington), hunting was a national passion. The clubs were gathering places where the sport competitions were located during the off-season of hunting. 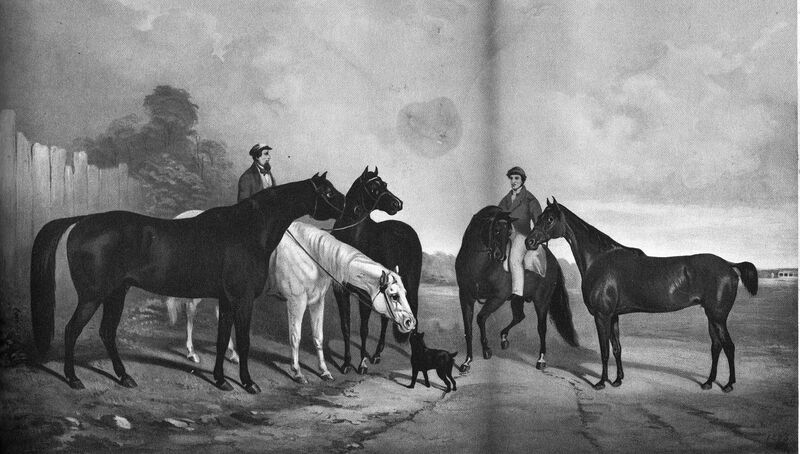 The Hunts themselves of course were performed across various properties (read more about Hunt Clubs in North American Sport Horse Breeder). It should be of interest to the American equestrian that George Washington--our first president, was an gifted horseman. He bred his own horses of all types, he owned pacing running horses that he entered in races, and he bred his own Hunters and utility horses. He was a superb rider and good trainer as well. His letters reveal he added Barb (Lindsay's Arabian) to his Running Horse stock, as well as coach for substance and after they were imported (sometimes by him) after 1750 or so he added Thoroughbred. Doesn't this sport horse recipe sound a little familiar? That means our first President, even before he assumed office, was breeding the same type of sport horse we breed today. And guess what? He was not alone in this. Every Plantation owner bred and kept hunters and hounds, it was a social custom, and the hunt was a huge social occasion. Visitors expected to be taken on a hunt, and to be entertained afterward with a feast and a dance. And here you thought the Europeans invented the modern sport horse! This custom was the same of the gentry of England and Ireland, and had long been established in their countries, and we, the English colonists, continued on with it. 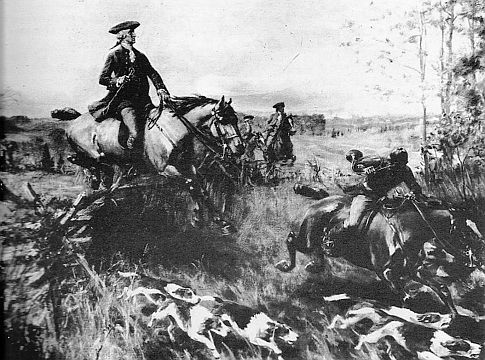 After the Revolution (1776-1783), all our traditions and customs became not just the providence of the gentry, but of any American who desired to take part, which resulted in the widespread Hunt Clubs mentioned above. When the new English Thoroughbred arrived in America (mid-1700s) it quickly became a prized cross for our native race-saddle horse because it too was fast and it added height to our much shorter Running Horse. This breed of horse has been continuously bred to our day, we called them Hunters until very recently, now we call them Sport Horses or even Warmbloods after the European influence, but the breeding philosophy and selection process is still the same as it was in 1700, and this is the concept that the modern American has been blind to: that we here, the 'uncultured Americans' (WBFSH 4/2003), have been breeding our own 'warmblood' sport horse since 1700 continuously to this day--three-hundred plus years. The first Hunter registry was in 1918 and in Canada in 1926. American Saddle Horse (ASA): This breed emerged when the breeders consciously separated a portion of our Running Horse stock and made their breeding choices to preserve the original excellent saddle horse traits of our racehorse that were being lost with excessive crossing in of the English Thoroughbred. This movement--our first foundation movement--began around 1800 by intelligent breeders like General Cooke and John Goode, and others. The first documented performance test (horse show) was in 1817. The American Saddle Horse was the first choice of the Confederate Army in the Civil War, and many famous Confederate chargers made it home to form lasting bloodlines such as Gaines Denmark ASA, John Netherland ASA and Mountain Slasher RH. The registry for this breed was established in 1891. It gradually went extinct when the Tennessee population separated itself in 1935 and then the breeders in Kentucky retained the original stud book to develop their own strain separately--this became known as the Saddlebred (see below). American Trotter (AT): This breed came about from selective breeding from those Running Horses that acquired a mid-gait of the trot, but retained the speed from their pacer roots. The first documented performance test for this strain was in 1818. Originally they were raced under saddle, but harness racing began to become more popular by 1840, both because a trotter was the preferred harness horse, and the northeast with its better roads bred mostly harness horses for utility use in its urban areas as well as for racing, so that the harness horse was bred there extensively. After a while the saddle horse was seldom seen in New England and New York City, and so the harness discipline gained ascendancy over the ridden trotter. After the Civil War the northern breeding centers gained more influence as well, as their southern counterparts and their breeding stock had been decimated by the war. The first registry was established in 1867. Later in 1879 the fastest of the Trotters were entered into a new register based on a 2:30 mile, the Standardbred was born, and gradually the American Trotter went extinct. Today, the ridden trotter is having a renaissance in our country; the ridden racing trotter was kept vibrant in Sweden, and the naturalized American Helene Gregory, who grew up riding Trotters in her native land, has sparked off the movement here in America to race our Trotters under saddle again. 'Monte Racing', as it is called in Sweden, has now come to America and many tracks are now holding ridden trotter races again--much to the delight of the spectators. All along these horses were prized as Hunters, all had a fine gallop and canter was well as their signature trot. 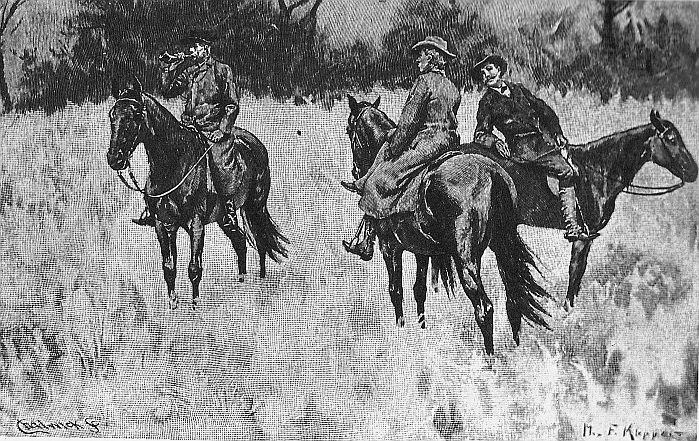 Even the English equine historian Henry Herbert (Frank Forester) rode an American Trotter to the hunt. A surprising amount of American Trotter made it into the European racers and through them into the modern sport horses. Some of the highest rated warmbloods of Europe are being powered by American lines--the very same lines they ban today! (Read a full history in Standardbred Sport Horses). Morgan Horse (MO): The Morgan was already recognized as a breed by 1820 and the breeders have been exceptionally organized so that by 1840 (AMHA) they further assembled and consolidated the descendants of Figure RH into a register. Their breeding criterion was to set the type of their foundation sire Figure RH into their breed based on him. The Morgan Horse has continued unabated as one of the oldest still existing sport horse breeds of America. However, not all the branches were sport oriented because Vermont, which is where this breed is rooted, did not even have a racetrack, and the racing traits were seldom selected for there. But we find it is through the sons and daughters of Sherman Morgan especially (his dam was a Narragansett Pacer), and to a lesser extent from Woodbury Morgan (his dam was Running Horse), that preserved and improved the racing speed at the mid-gait. 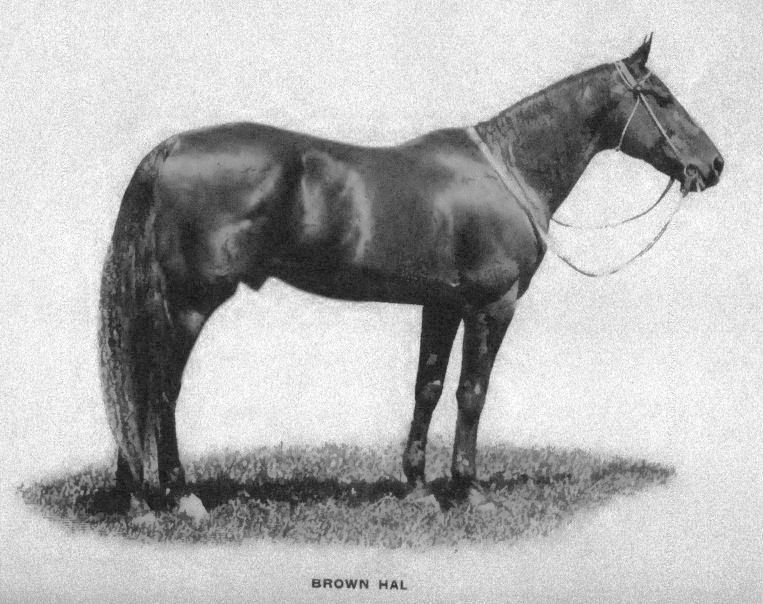 Some of those lines came down through a branch formed from the genetics of Black Hawk MO (trotter) and the lesser known Copperbottom RH (pacer)--all are found in the later Standardbred, the American Saddle Horse derivative breeds and the Quarter Horse. Further north, the sporting Canadians bred a fine sport breed mostly based on the Morgan/Narragansett cross--see below. In the modern era the sport bloodlines of the Morgan were isolated and performance tested from 1906 until 1950, when the Morgan was selectively bred for the ultimate in cavalry traits. The testing used was under saddle work (dressage), show jumping, cross-country runs and then three-hundred mile endurance ride. This was a far more severe trying and culling process than any other sport breed I know of, and the bloodlines forged in that furnace are pure sport gold. The first stud book was Linsley's in 1857, followed in 1894 by Battell's massive work. (Much of the breed history and its contribution to today's sport horses in covered in Standardbred Sport Horses). When I wrote North American Sport Horse Breeder I thought the Canadian Pacer was formed by importation of Running Horse stock from America and from Nova Scotia crossed on their light farm breed of Canadian Horse--and these strains were indeed part of the mix. With further investigation I discovered the strongest genetics in this breed arose from the Morgan/Narragansett cross--which also produced the best sporting lines in the Morgan. (A full history of this fine breed is found in Standardbred Sport Horses). This breed became the preferred sport horse breed in Canada. By 1850 it was rated a first class racehorse breed that competed as an equal with the American Trotter and Pacing Running Horse all across North America, and all three racehorse breeds were absorbed into the later formed Standardbred register. American Thoroughbred (TB): The American Thoroughbred is genetically different from every other Thoroughbred population. All the other Thoroughbred breeding countries bred up from the GSB registered English Thoroughbred stock exclusively, but in America our TB had American Running Horse lines in it as well. The origin of this breed is very muddled, mainly because of the lack of knowledge and recognition of our first rate Running Horse racehorse breed, and historians (like Hervey) somehow not quite understanding that the English Thoroughbred was not in America until immediately before our Revolution. He liked to say some of our earlier racers were Thoroughbreds--this has led to generations of miss-labeling of famous Running Horses as Thoroughbreds. Hervey and many others did not recognize the racing done before this period--1868--was performed on our own developed racehorse breed, and their refusal to honor the work of our gifted early American breeders has contributed to their work and their breeds being forgotten. (This controversy is fully discussed and documented in Standardbred Sport Horses). It was only in 1868 that S.D. Bruce's stud book came out, with its clear requirement of at least five generations of strictly English Thoroughbred ancestry (GSB registered stock), along with the acceptance of the English performance test of the 'classic race' (one to two-mile dash race). Therefore, the greatest staying racehorse of all time, Lexington RH, who still holds the world record of sixteen years of winners, is not a Thoroughbred. The Thoroughbred was a English organized breed (1670--although the term "Thoroughbred' was not assumed as its breed name for another hundred years which is also when the classic race standard was set), and we could not call our racehorses Thoroughbred or be registered as such unless we qualified in the requirements listed above. (The full story on our native Thoroughbred, why it was exceptional and its pertinent bloodlines is found detailed in Legacy of Lexington). The American Thoroughbred proved so fast, sound and stamina loaded that when it traveled to England and Europe in the late 1800s to compete, it like our Running Horse before it, proceeded to win in flat racing, steeplechase and jumping contests. Even with relatively few of our horses making the trip, it is a fact that by 1880s our new Thoroughbred had conquered all the European and English classics, and then its offspring born there was doing the same (see this outlined on the Origin of Sport Ability page). If you have bred European warmbloods in this country for any length of time you have heard continuously that the American Thoroughbred is a poor choice for sport horse breeding stock, the usual explanation given is that it is built downhill and is a sprint-only breed. Perhaps the WBFSH member registries are confusing our Thoroughbred with our wonderful American Quarter Horse, which indeed was selectively bred from colonial times to be a sprint racer? Our much maligned Thoroughbred is a genetic warehouse of not only immense speed, but it also contains the greatest distance racing genetics in the world (see Real Stayers)--selected for and proven with heat-racing for two-hundred years (potency), setting world records that have never been broken since. And contrary to the repulsive dogma spewed at us continuously, it is the highest rated Thoroughbred in the world and provides 25% of the world's stamina bloodlines. We can see then that those American hating European registries that pass on these lies, know little or nothing about our breed, and have forgotten their own draft horse base stock carries our American racehorse in their best bloodlines, both our galloper and our trotter. Here is the truth: without the real sport breeds (English and American) that the Europeans poured into their draft horse base, the European warmblood breeds would not be able to do anything but pull a plow. I say this because after forty years of the relentless put-down of American breeds by these invasive registries, our own equestrians now believe and repeat this garbage as if it is fact, having trusted the officials of these organizations to be honest, when in fact their aim has been to destroy our sport horse industry and replace it with their own, and unfortunately when the psyche of our own equestrians is so violated that they believe the invaders' propaganda over own history, then it is time some of us seniors stand up and put a stop to it. Quarter Horse (QH): Our Quarter Horse, the most popular saddle horse breed in the world, is also the best sprinter racing breed. It was always a dual-purpose breed, both a sprint racer and a cattle-working stock horse. It specialized from the original Virginia sprint and pacing Running Horses and the saddle stock developed from them, with the addition of Morgan, English Thoroughbred and the tough mustang blood of the plains. By the time classic distance branch of Running Horse fixed its breed criteria to become "Thoroughbred", our sprint racing branch of Running Horse was centered beyond the Mississippi River, and was, along with its branch that worked on ranches, a breed of its own; therefore 1868 is an appropriate date for the true birth of the Quarter Horse. The registry was formed in 1940. Our Quarter Horse, while most often found in the western sports that it excels at, is also a formidable Hunter Horse, and several Quarter Horses have been winning international jumpers, like Almost Persuaded QH and the Hall of Famer Nautical QH. Sport is in the American breeds because it has always been a sport horse, and no matter which of the many talents it possesses that it is being used for, it always carries the base sporting genetics that can be developed for our modern Olympic style sports. Standardbred (ST): When John Wallace opened his Standard Register in 1879 to gather all those American Trotters that could go a mile in 2:30 or under, the Standardbred was born. It was later in 1891 when it took in all the fast pacing racers--Running Horse and Canadian. Already a prized Hunter Horse, it has gone on to provide some of the most powerful sport lines in the world. American Saddlebred (SB): When the Tennessee branch of American Saddle Horse separated to preserve its 'running walk' gait in 1935 , the American Saddle Horses who could trot as well as do its pace derivative gaits retained the American Saddle Horse stud book, changing its foundation sire list to those that reflected its own strain, and thus became a breed of its own. Eventually Gaines Denmark ASA was made the sole foundation sire of this breed. Tennessee Walker (TWH): in 1935 the breeders in the Tennessee region removed their strain of horses from the American Saddle Horse registry by forming their own registry to preserve and promote their 'running walk' gait--thereby signaling the separation of strains of American Saddle Horse into its descendant breeds. Bald Stockings RH (Tom Hal RH/Copperbottom RH) was the strong foundation. The main bloodlines that became the Walker were also the prized bloodlines for the Confederacy in the Civil War, and for the Hunter Horses. So sure-footed and fearless that fox hunting was regularly carried on at night--with very few accidents. The horse that became the TWH and the Standardbred were some of the greatest Hunter Horses there has ever been. The TWH is lately making a name for itself in dressage, both gaited and regular dressage, and contrary to some of the hasty scientific literature published on the gait-keeper gene, that proclaimed that all gaited breeds have a poor canter, in fact one of the normal gaits of the TWH is the canter and the counter canter. (See Standardbred Sport Horses for more on this subject). Missouri Fox Trotter (MFT): The breeders in the Missouri region selectively bred their own version of the American Saddle Horse to preserve and promote its 'fox trotting gait', so 1935 works for them also--their registry opened in 1948. Long valued for their comfortable gaits and sweet disposition, making them a preferred pleasure and trail horse, today the Fox Trotter riders are discovering their mount is a natural jumper. The breed list above is those North American breeds that are directly descended from our original Running Horse. Most of them also carry large measures of our Heroic Era racers in their background (heat-racing) as well, and so there is a strong genetic affinity in these breeds based on the best sport genetics in the world. With selective breeding you can bring the power of those sport performers of yesteryear to the fore in each of these breeds quite easily once you understand the genetic importance of specific ancestors. And crossing these breeds, if done judiciously, can also build up tremendous background power in true sport performance. Each breed has developed potent bloodlines of its own, that we can target for our own projects. But we are twice blessed here in our American breeds because they all arose from our original Running Horse, a sport horse of the highest caliper. There are common bloodlines in all of them--giving us a rich genetic fabric that is all sport--right down to its roots.